4th PAGCOR National Photography ~ Philippine Freebies, Promos, Contests and MORE! Didn't get lucky in last year's competition? No worries! 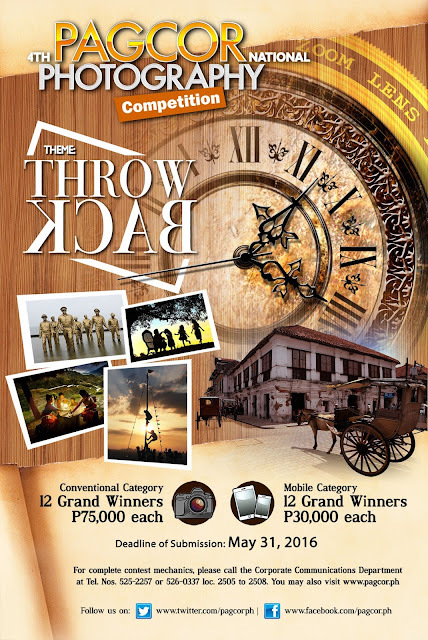 Submission is still open for the 4th PAGCOR National Photography Competition. Running on the theme "Throwback", travel back in time and reminisce our country's glorious past. Take strong photos depicting the Filipino's cultural history from food, traits, historical sites, culture, celebrations, etc. Choose your category or you can submit on both: Conventional Photography and Mobile Photography. Register online first before uploading your entry. Since you are allowed to submit only two (2) entries, we encourage to enter your best shot. There will be screenings in Luzon, Visayas, Mindanao and Metro Manila. From these entries, five (5) will move on to the Grand Finals. Cash prizes worth P75,000 and P30,000, plus trophy, will be awarded to the Grand Prize winners of the Conventional and Mobile category. For the non-winners, each will receive P20,000 and P5,000 plus a Certificate of Merit. Moreover, a special prize worth P5,000 + Certificate of Recognition will be granted to the Most Popular Photo with outstanding number of online votes. Theme: "Throwback" - Positive things or images that are reminiscent of the Filipino's traditional way of life such as food practices, food traits, historical sites, culture, celebrations, etc. Photos should be in digital format/file. For more info, log on to pagcor.ph or call the Corporate Communications and Services Department at 525-2257 or 526-0337 loc 2505.